I mentioned that I was baking pizza muffins this morning on my gfe Facebook page and folks perked up quicker than if I’d handed them an authentic Italian double espresso. Almost everyone who responded asked for the recipe “stat”! But first things first … in my posts there, I called these Pizza Muffins grain free as well as gluten free and dairy free. They are the latter for sure (and more), but I did include Daiya cheese, which I now realize contains some xanthan gum. Because xanthan gum may be derived from corn (and are in this case, read on), these muffins are not 100% grain free. Rats! I’ll have to see if there’s another option that can be used to ensure that they are completely grain free. My apologies! Thank you for your interest in Daiya and our deliciously dairy free products. We do not claim that our products are free of corn. Our products are free of dairy (casein and lactose), gluten, eggs, rice, peanuts, and tree nuts (except coconut oil). We have two ingredients that are derived from corn: xanthan gum and citric acid. For a full list of ingredients, please visit our website www.daiyafoods.com. If you have any questions or inquiries, please let me know. I appreciate Daiya’s prompt, clear response, but I also have to add that this type of situation is why I don’t often use processed foods with my gfe approach. When I’m dealing with real, whole foods, no inquiries to the manufacturer are needed. I am grateful that products like Daiya exist for dairy-free consumers, but I would prefer that ALL ingredients be spelled out on the label, whether it’s required by the FDA or not. 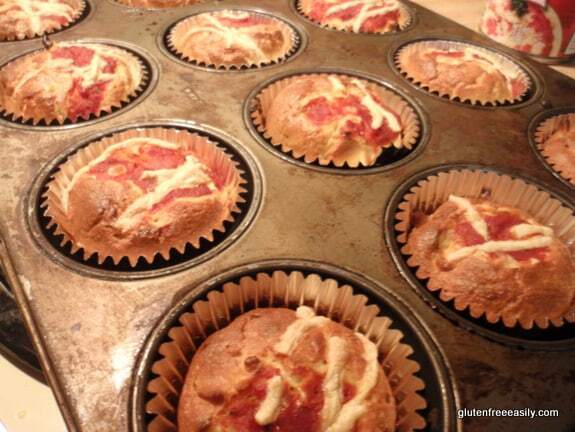 Back to the muffins … some said that these Pizza Muffins sounded like a really good lunchbox option for their children. I totally agree! With that in mind, one specifically wanted to know how these muffins tasted cold. The answer? Good! And good at room temperature, too. I knew they would because the original recipe for Pizza-Flavored Muffins comes from one of my favorite bloggers, Kalyn of Kalyn’s Kitchen, and the caption under her opening photo stated: “These Pizza Flavored Breakfast Muffins are for everyone who likes cold pizza for breakfast!” That alone would be enough to convince me to adapt Kalyn’s muffins, but I also know that Kalyn offers some of the healthiest and tastiest recipes on the web. Many of her recipes are naturally gluten free and several have been made in our house over the last few years. Kalyn’s Roasted Mushrooms with Garlic, Thyme, and Balsamic Vinegar recipe just topped our ribeye steaks for dinner—such an easy way to take steak to the next level! But returning to Kalyn’s Pizza Muffins, her recipe did contain some whole wheat flour and it also contained dairy. I wanted to make this recipe both gluten free and dairy free. Many of my gfe readers are looking for gluten-free, dairy-free recipes. Pizza—or pizza-themed—recipes that meet both requirements are not that common. The changes needed were not that difficult to figure out though. I used a combination of more almond flour and some coconut flour to replace the whole wheat flour. I opted for dairy-free yogurt instead of cottage cheese. Instead of Parmesan cheese, I toasted the same amount of almond flour to use in its place. (Some might decide to use nutritional yeast instead.) Mozzarella cheese was easily replaced by Daiya mozzarella shreds. I made a few additional tweaks to Kalyn’s recipe just per my personal preferences, like topping the muffins with some pizza sauce and mozzarella shreds. I wanted anyone grabbing one of these muffins to take one look and know that they would be eating a Pizza Muffin. But I also wanted that pizza sauce and mozzarella on top for taste as enough of each ingredient is key to any good pizza dish in my opinion. 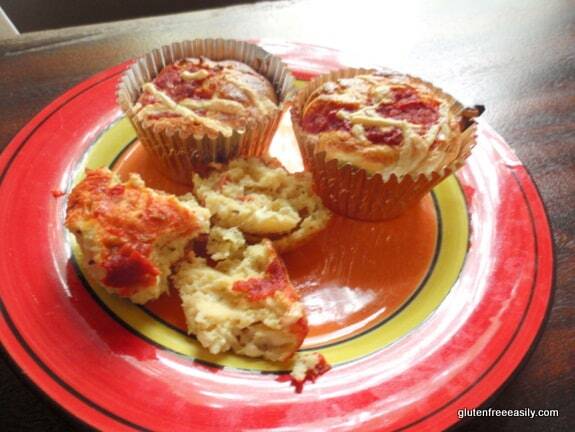 After making these muffins, I decided that I’d gone too light on the pizza sauce on top. I wanted to get the muffins picture perfect before I posted so at first I simply promised my gfe Facebook readers that I’d post the recipe this week. But then Annie said, “Stop teasing us & post the recipe!! !” Okay, okay, I can’t stand to be called a tease, so I won’t make you all wait any longer. I tested these muffins out on my support group today at our annual picnic and the reviews were all “two thumbs up.” After folks sampled these muffins, the individuals who were both gluten free and dairy free asked, “these are dairy free? Really?” When it’s hard to believe that recipes are made from alternative ingredients—or without standard ones—that’s the very best indicator! So I think—and hope— that these Pizza Muffins are ready enough for you and yours. Finally, I love them every way I’ve sampled them … warm out of the oven, cold out of the refrigerator, or reheated slightly in the microwave! Turn on broiler. Spread 1/3 cup almond flour on ungreased baking sheet. Broil for about a minute and a half, stirring twice, until most of the almond flour is lightly browned. (Do not walk away from the broiler during this time or almond flour will burn.) Remove baking sheet from oven and set aside momentarily to cool. Spread pepperoni slices on microwave-safe plate lined with two paper towels and topped with a paper towel. Microwave on HI about 30 to 45 seconds. Remove from microwave and use top paper towel to blot grease from pepperoni slices. Use kitchen shears to cut into smaller pieces; irregular pieces are fine. Set aside. Reduce oven temperature to 400 degrees Fahrenheit. Grease 12 muffin cups well or line with cupcake liners, spraying each lightly with non-stick spray or oil. Add eggs to a medium-sized bowl; whisk. Add in almond flour (toasted and “untoasted”), coconut flour, baking powder, sea salt, pizza seasoning, Daiya cheese, and pepperoni. Whisk all to mix. Spoon about a tablespoon of pizza sauce on top of the batter in each muffin cup. Sprinkle a few mozzarella shreds on top of the pizza sauce in each muffin cup. Bake about 22 minutes. Check with a toothpick for doneness. Serve. Store any remaining muffins covered in refrigerator. I always use Honeyville Almond Flour. This recipe is also soy free and even refined sugar free if you use a refined sugar-free pizza sauce or substitute tomato sauce for the pizza sauce. (Blot tomato sauce with paper towel to remove extra liquid.) For a vegetarian option, pepperoni may be omitted or replaced with another ingredient like spinach or zucchini. Be sure to wring out all excess liquid before adding to batter. Really you could add just about any ingredient that you enjoy on any pizza! If you can eat dairy, feel free to use dairy yogurt and dairy mozzarella cheese. Looks delicious! I was on that same wavelength today and was thinking about baking bread in a pie pan with tomato sauce and cheese on top. Never got around to it, but love the muffin idea! These look really good and easy too! Could you also make this with your rice flour/corn starch mixture instead? That’s all I have! Also, did you see I did a gluten free recipe on my blog over the weekend? It is Rice Crust Pizza… you see, both kind of Pizza receipes, we really ARE sisters under the skin! Maybe one day I will be able to afford almond flour but not right now… My husband and son love my Rice Crust Pizza and I would have taken a photo of it, but we gobbled it down too quickly! I have another recipe on my blog. It is a very easy cake recipe that I adapted to be gluten free by just changing the flour and I took photos! Bad photos, but photos, nonetheless! Keep taking photos … you’ll get better and better! These look wonderful Shirley! Great alternative for people with grain/dairy free diets! Plus, they look so pretty too! Your muffins look absolutely delish! And thanks for the nice thoughts for my blog too. Thanks so much, Johnna! Wow, gf/veggie pepperoni! I’d love to give that a try. 🙂 Thanks for sharing with us all! Wow! Love this recipe Shirley! 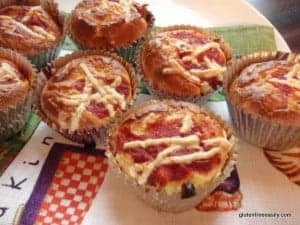 I’m going to try some pizza muffins this week or next. Too much fun! Looks wonderful! Please explain the coconut yogurt…? Is that Paleo-friendly as well? Hi Lisa–It looks like you are new here—welcome to gfe! 🙂 There are some purchased dairy-free yogurts that can be more paleo friendly per my paleo expert, Stacy (Paleo Parents). She told me that she goes for ones that are dairy free, sugar free, and soy free. They have preservatives, but for a purchased product occasionally, it’s not the worst choice. One can also make one’s own yogurt like Lexie did here with her almond milk yogurt. FYI: There are many other dairy-free yogurt recipes as well. 🙂 I hope you get to make these muffins! InTolerant Chef–A love of pizza with pineapple–cool! I haven’t had a pizza with pineapple in a very, very long time, but it sounds very good. 😉 I hope your daughter will enjoy these! I have said it before and will likely say it again, Shirley you are brilliant! I can’t wait to put these in my kids lunchboxes. This looks so amazing. I’m bookmarking to make asap! Ok. I think you may have forgotten to say when to add the Daiya cheese to the batter. I read it a couple of times and it says when to put the shreds on top but not when to but the 3/4 cup in the batter. Hi Karen–You are right! Thanks so much for helping me with my quality assurance here at gfe! 😉 I did one of those change at the last minute things. I was going to say “add remaining ingredients except …,” but then decided to list them and, of course, then forgot the Daiya. 🙁 BTW, you could pretty much mix up everything all at one time except for the toppings with this recipe and not go wrong. I’ve never been one who worries too much about dry and wet being done separately or in a different order. If you use Hormel’s gluten free turkey pepperoni, you won’t have to do the de-greasing thing. We use it because we don’t like the fat in the regular product. Hi Barb–I haven’t been fond of any of the turkey versions of such products so far, but I’m willing to try again. 😉 The pre-cooking is as much about getting crispy bites as it is about no added grease. Thanks so much for your input! I have never EVER thought to make pizza muffins, but now I will totally be making these for dinner this week! What an absolutely brilliant idea!! This combo looks so wonderful and I have not yet toasted my almond flour before. I am really looking forward to trying that with these. Hi Kim–Well, the idea kudos go to Kalyn, but I loved adapting this recipe. 🙂 I hope you and the boys enjoy these. You could make different variations (pepperoni, sausage, etc.) and I’m sure you’ll tweak your version some. 😉 I look forward to hearing more. Drizzling a tad of olive oil on the almond flour before toasting might give it a more Parmesany vibe. I didn’t think of that at the time, but that combo works well in Ali’s zucchini casserole that I make. These look SO yummy. I am so excited to make them! Thanks for sharing! Hi Natalie–It’s so nice to see you here at gfe again. 🙂 I hope you’ll really enjoy these! Your Pizza Muffins look like something my Grandson, Ryan, who has autism might like. Is it possible to add an allergen free shake mix to your muffins which have vitamins, protein, fruits and vegetables, etc. for his nutritional therapy? The doctor says he needs to gain weight. It is not an easy task to find nutritional food to feed the mind with a picky eater. Ryan loves pizza as do all kids. I can see these muffins replacing those gluten free cupcakes at his birthday parties and solving the sugar problem at the same time. I really think that most of us feel better grain free. Almond flour and coconut flour have been my “go to” flours of late if I’m not making a flourless recipe. I can feel a difference in my joints when I consume my standard rice flour/cornstarch combo too often. Pizza muffins? You are absolutely brilliant, Shirley!!! I’ve made pizza with an almond flour crust before and loved it, so I’m sure these are incredible! These can be so easily adapted for the SCD, I think they look fantastic! There only needs to be some very slight changes! They’re SO good I shared the link on my facebook page! I hope people came and had a look! When I make them I might post the recipe and link back to your recipe! Excellent idea! Hi Vicky–This news is wonderful! Thanks so much for reporting back and sharing on your Facebook page! Can’t wait until you share your post, dear! 🙂 I just took a peek at your FB page and saw that onion gravy, too. I’ve never been a fan of gravy (even gluten-full gravy), but onion gravy? Now that might change the equation a bit. 😉 Seriously. Thanks, Linda! I’d love to hear feedback if you make these with real cheese. 🙂 I’m sure they would be a big hit if dairy yogurt and cheese were both used. 😉 I was pretty happy with the dairy-free version though! I agree with you on using the non-processed foods. Completely. Another negative for Daiya is that they have titanium dioxide in their product. It is a heavy metal that is not good for people. I wish that manufacturers would find another way to make white color. I am hoping to work on a homemade cheese that will be safe for us allergic folks and have no grain or heavy metals in it :-)! Hi Adrienne!–Thank you!! Yes, I know on the processed foods. I follow the same approach with doing dairy free as I do with gluten free *most of the time* … meaning that I go for recipes that are naturally dairy free or dairy free easily—dfe. But Daiya can bridge the great dairy/cheese lover divide for cheese lovers in some recipes. However, you’re completely right, titanium dioxide is an ingredient that nobody would choose to have in their food. 🙁 What is the color without titanium dioxide? I think we are completely hung up too much on color in some cases. I’d rather have natural color or add ingredients that give color like Lexie did with her Raw Nacho Cheese Sauce than have chemicals/metals in my food. Brilliant! Absolutely brilliant! I love it. I also laughed at the “tease” comment. This is so great. You can do so many variations. And this will be in the arsenal as Max gets older. Great for parties, lunches, etc. Brilliant! I made these for dinner tonight. Delish! Just curious – what is the reason for toasting the almond flour? Thanks for sharing so many great recipes! I think I made three of yours today! Hi Melissa–I’m happy to see you here at gfe again! 🙂 And I love your feedback on the pizza muffins—thank you! The almond flour is toasted to give it more of Parmesan cheese texture and taste. I used it as a substitute for the Parmesan cheese that was in Kalyn’s original recipe that I adapted. You may decide that toasting it doesn’t make that much of a difference and just add that amount untoasted to the other amount of almond flour in the recipe. Hi Beverly–Welcome to gfe! 🙂 I’m hopeful that an egg substitute will work, but haven’t tried it myself yet. Four eggs are a lot to replace, but I’d give it a try. Either egg replacer or chia eggs seem like the best bet. Maybe a combination of the two? Wait, can you eat soy? I’ve read that Vegenaise is also a good egg replacer. There’s an even a soy-free version, but don’t know how comparable the two are. Good luck … let us know! Beverly–This may sound silly, but what if you halve the recipe and use the vegenaise? If that works, then make it again using the regular amounts and see if that will work, too. Logically, it seems like it wouldn’t make any difference, but I know some of my own recipes don’t do well when doubled so it’s worth a try to do the “reverse” so to speak. 😉 Good luck! Ooooo – the kiddo is going to get some of these. Oh yes, he is. Of course, HIS will have turkey pepperoni diced up in them. Cause, you know, that’s how he rolls. Deanna–Yippee, because I love to make the kiddo happy! 😉 Hope he loves his version! These wonderful muffins could easily be adapted for the SCD! Yum yum! For our tomato-free guy, we’ll have to substitute some pumpkin and red pepper puree for the pizza sauce – easy-peasy! But 4 eggs sounds like more than we can substitute safely with chia seeds. Can you make any suggestions for the egg-free folks, like us? Hi Angela–Yes, I know that usually subbing for 4 eggs is tough to do. I feel like this recipe would work with egg subs, but haven’t tried it myself. You might halve the recipe the first time around and try two chia gel eggs. If that works, then you might go ahead and try the whole recipe with four chia gel eggs. But with more than two eggs needing to be replaced, you might have to come up with a combination of egg replacers. Maybe add in two flax eggs? Use commercial egg replacers? Sub some cold mashed avocado for one or two eggs? I’ve used cold mashed avocado for one egg in cookies before; see that recipe here. And mashed banana can work. If it’s only used for one egg in addition to these other ingredients, it might not throw off the taste. Tofu or soy flour in combination with water can sub for an egg if you eat soy. There’s also a new product called The Vegg that might work for an egg or two. I’ve learned that there are a lot of things you can do to replace eggs, but it depends upon the individual recipe and how many eggs are needed. Good luck with your experimenting! Please let us know how things works out. These are a great idea, Shirley — I’m looking forward to trying them. Wow Shirley, you really outdid yourself with these, I can’t wait to make them!!! I would have never even thought of checking for grain in the cheese, you are so thoughtful and thorough! Cassidy–Thanks! I hope your family enjoys them, too! 🙂 I’d have to say whenever I use processed ingredients, I’m reminded of how complicated it can get and want to return to very basic ingredients. 😉 Next time I want to just try these with some nutritional yeast. Ghee might be worth trying, too, although I know that ghee is not for all who avoid dairy.